Screensavers are software utilities designed to help you protect your display against dead pixels by displaying animations. Usually, these aim to please the end users by also providing them with pleasant animations, if they ever need to decorate their workspace. Enjoy new free clock screensaver! You will find great nature scenery with realistic animated water effects. Nature sounds are also included in this screensaver. Transparent animated analog clock is located at the center of the scene. Different settings and animated preview will surely impress you. Simply stated, you can protect your screen against dead pixels and personalize your workspace. You can choose between 6 different quality profiles, according to your preferences or computer's capabilities. It is also possible to enable or disable looping. 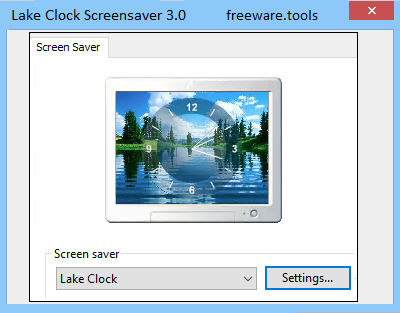 All things considered, Lake Clock Screensaver is a tool that lets you protect your display against dead pixels by rendering a relaxing animation of a lake with an analog clock overlaying it. It also has sound effects and provides you with a minimalistic configuration window, where you can adjust the quality by choosing your favorite profile.